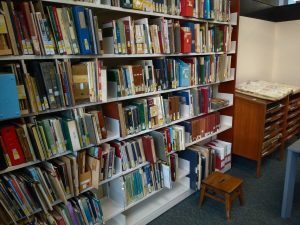 The White Plains Public Library has a Local History Room again! 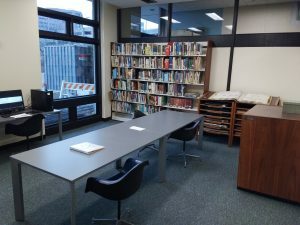 We now have a dedicated space for people interested in local history and genealogy to explore the White Plains Collection. We are having an opening event on Thursday, December 7th, from 6:30 PM to 8:30 PM. We will open up the new space and highlight two local amateur historians. An exhibit created by Colleen Fay that documents the suffrage movement in Westchester will be on display and we will hear a presentation from Nate Levin about the historical narratives that compete to define the movement. We will have refreshments, interesting historical materials to view, and Levin's presentation will be followed by a discussion. A view of the new local history room with some evidence of our renovations visible outside! 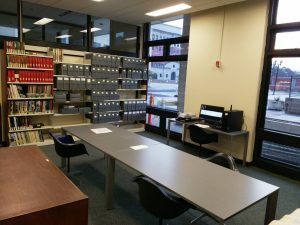 A view of the new local history room. We have a new microfilm scanner/viewer that is available for use by the public. We've been using it to digitize some of our newspaper collection. 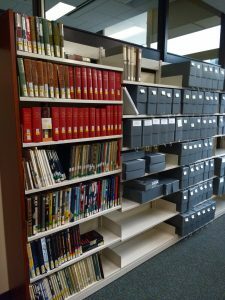 Our local history book and published document collection is back. A good way to learn a new story about White Plains' past is to walk up to this shelf and randomly choose an item! In the corner you can see our atlases. 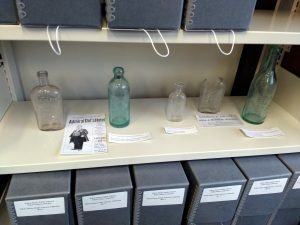 Some funky bottles that haven't seen the light of day in years filling in the empty space on our shelving (space intended for future collections–we're always looking to add unique historical materials to the White Plains Collection!). 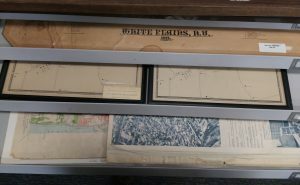 There are some really unique items in our map cabinet–19th century maps showing how farms were laid out to 20th century maps that promoted local businesses. 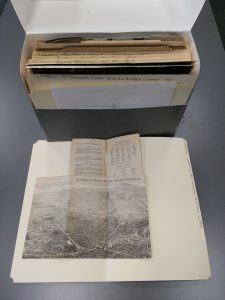 All of those plain looking archival boxes are full of interesting documents, like this pamphlet that includes a unique aerial view of Westchester. Public space is reserved for our most useful and popular collections. We hope more people will dive into our subject files and the smaller collections donated to us over the years by the likes of John Rosch and Richard Crandell. The smaller boxes on the left are for photographic collections. Our City Directories and Yearbooks are easily accessible. 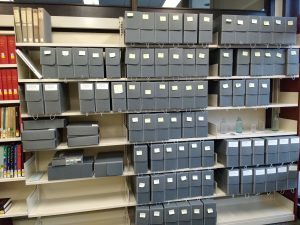 And our subject files are back–this time in proper archival boxes! Look for future editions of the White Plains History Roundtable in this space and contact Ben if you're interested in doing research here. Roundtables are educational, participatory, and social events where attendees hear a presentation on a historical topic, examine materials from the White Plains Collection, and engage in discussion with each other. Our collection is full of informative materials and people are full of fascinating stories. 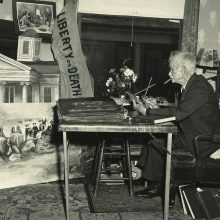 It's my hope that our new local history room connects people to history and each other.